Advanced Charts for Excel are integrated into Excel as add-ins allowing to select a range and create a customized and advanced chart. The advanced charts are designed to simplify visualization of complex data and for technical analysis. The chart add-ins are available separately and include Waterfall, Box and Whisker, Cluster Stack, Marimekko (Mosaic), Dot Plot and Cascade chart types. the add-ins are compatible with Excel 2007, 2010, and 2013 for Windows as well as Excel 2011 for Macintosh. Trace a starting value through intermediate factors to a final value. Include data labels above the plotted bars. Sort categories by value or label. Use raw data or compiled statistics. Choose from several statistically valid quartile definitions. Show or hide outlying data points. Choose horizontal or vertical orientation. Create charts with clustered and stacked columns or bars. Define the number of clusters, number of stacks per cluster, and number of items per stack. Quickly create Marimekko (or mosaic) charts. Use original numbers and the add-in calculates all the percentages. Turn the line chart on its side. Enter actual values, and the program makes all calculations for the dot plots. Chart stacked variable width columns or square sided areas. Enter actual values, and the program makes all calculations for size percentages. 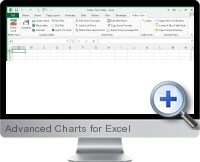 Advanced Charts for Excel can be customized with specified colors, fonts, and other formatting. The charts can also be easily created dynamically from VBA programs.